Anti-intellectualism has been a constant thread winding its way through our political and cultural life, nurtured by the false notion that democracy means that “my ignorance is just as good as your knowledge” (Isaac Asimov). French philosopher Jacques Derrida describes literature as “the institution which allows one to say everything, in every way”. The democratic instrument – therefore – exists, but we do need to have writers who analyse and study the current social and political situation of our country. 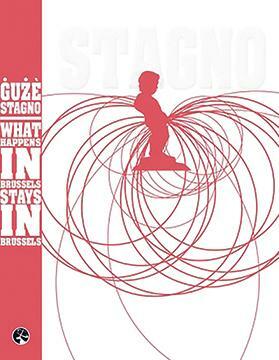 This is what Gużè Stagno largely does in his pop, one-of-a-kind novel What happens in Brussels, stays in Brussels, published in 2013. The illustrations by Jimmy Grima, drawn in the first-person perspective, complement the narrative as their style lends itself perfectly well to the mood of the book. In What happens in Brussels, stays in Brussels, Stagno depicts the trip of a colourful group of canvassers and Labour supporters who visit Brussels on a familiarisation tour. The tour is intended to give them an idea of how the European institutions work. However, it ends up – rather expectedly – as a vacation trip. Gustav Azzopardi, a journalist of MaltaNews and the main character of the novel, ends up among this group to interview, reluctantly, Labour MEP Charlo Pulis, who is hosting this trip. Unlike Louis Grech and Silvio Parnis – real-life Maltese politicians who make their appearance in the novel – Pulis is a fictional character, though he is rather representative. Stagno takes his iconography mainly from the Maltese socio-political scene. He perfectly captures the typical Maltese character through the array of stereotypes he portrays. In an interview in 2013, he describes these characters collectively as “the Maltese idiot abroad”. In fact, they do behave like idiots. For example, during a lecture about EU institutions, the only question they manage to ask – in a rather arrogant way – is how will the EU help Malta with illegal immigration? When they pass in front of Dar Malta – at that time symbol of the excess of the opposing political party – they start booing. Their political partisanship is blind. They don’t have their own personal opinions, and one who dares have an opposing opinion to their party’s stand is immediately accused of being a traitor. Moreover, racist and homophobic remarks are scattered throughout the novel. What emerges out of such traits, then, is that they are racist, homophobic, politically brainwashed, but above all idiots. What is even more tragic is that these traits, according to Gustav, are partly genetic and partly a product of the social and political local situation. Among such narrow-mindedness, Gustav represents a ray of light. He is not a blind follower of his political party. He has his own opinions and is very aware of the situation. This kind of blind party obedience still dominates the mindset of the Maltese. However, one cannot accuse Stagno of being judgemental. Although his characters are as stereotyped and funny as commedia dell’arte characters, sadly enough, they are real. They do reflect a significant percentage of the Maltese population. It is not that Stagno ridicules them; they are indeed ridiculous. Stagno, therefore, is simply stating facts. And by stating such facts he is challenging the mono-think tendencies of hyper-partisanship and authoritarianism. The irony becomes explicit commentary. What happens in Brussels, stays in Brussels is, surely, much more than just ‘funny’ reading. There is much to be admired in this novel in terms of the socio-political analysis, and in Stagno’s pen literature becomes indeed a democratic instrument. Halfway through the novel there is a discussion about democracy, between Gustav and the secretary of the MEP – naturally voicing the author’s own opinion about the ‘democratic’ situation in Malta. Referring to “the Maltese idiots abroad,” Gustav expresses his opinion: they are “a product of society in general and of the politi­cal system in particular”. He concludes that “ignorance is the real foundation of democracy. Without ignorance, the democratic system collapses”. Ingeniously, therefore, Stagno uses the “democracy” of literature – in Derrida’s words “the space of democratic freedom (freedom of the press, freedom of speech, etc. )” – to speak about the ‘democracy’ of Malta. One must say, however, that his statement about democracy does not strictly apply to the situation in Malta. Brexit is another case in point where popularism is, tragically, the foundation of democracy. Democracy thus becomes an unfortunate instrument whereby, in Bertrand Russell’s words, “the fools have a right to vote”.